Linfield boss David Healy believes the win over Carrick Rangers was a routine victory and that his team was never under any pressure. 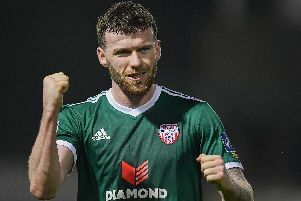 “People expect you to turn up against teams in the bottom six and roll them over, but I knew that wasn’t going to be the case with a Davy McAlinden-managed team,” he said. “I know how he operates and the way he goes about his business. “Carrick Rangers are fighting for their lives and they have got some good young talent in their side – and a manager who has been around the league for some time. They were never going to come here to chase the game, so we had to earn the points. “Without wishing to be disrespectful to Carrick, I thought we were the better team by far over the 90 minutes. We dominated right from the start, but lacked a cutting edge. “Had we got an early goal, it would have made it a little bit easier. Some of our play was good. Sometimes the fans expect us to blow teams away at Windsor, but that’s not the case. Carrick were happy to concede possession. Sometimes the fans expect us to blow teams away at Windsor, but that’s not the case. Carrick were happy to concede possession. “There’ll be no other goalkeeper coming in. Alex hadn’t that much to do against Carrick, but what he did, he did it well.